bored with the built-in Messaging application? Want more features sms for your mobile? chompSMS is for you, with lots of extra features like chat-style bubbles, contact pictures, quick reply, signatures, templates, blacklisting, heaps of customizations, themes, FREE texting using the **TextFreek Service** and much much more! Plus, if your mobile carrier charges a lot for texting (internationally for example) you can buy chompSMS credits to send much cheaper text messages. NEW: TextFreek Service (built into chompSMS) lets you text iPhone, iPod, Android and BlackBerry devices for FREE! The chompSMS application is completely free, with no obligation to buy anything from us. 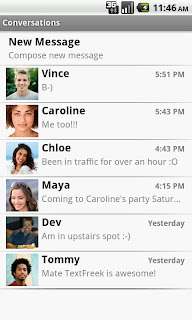 For text messages between your friends using the TextFreek Service on iPhone, iPod, Android and BlackBerry it's FREE. You only need to buy chompSMS credits if our rates are cheaper than your mobile carrier. Our rates are the same to any supported country in the world regardless of origin or destination. Otherwise simply use this great app for free and enjoy!